In the new novel featuring war veteran Peter Ash, “an action hero of the likes of Jack Reacher or Jason Bourne” (Lincoln Journal-Star), Ash has a woman’s life in his hands—and her mystery is stranger than he could ever imagine. 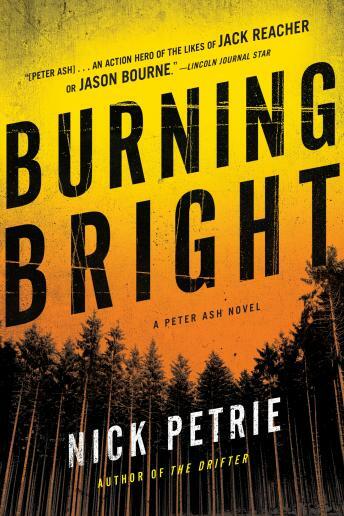 War veteran Peter Ash sought peace and quiet among the towering redwoods of northern California, but the trip isn’t quite the balm he’d hoped for. The dense forest and close fog cause his claustrophobia to buzz and spark, and then he stumbles upon a grizzly, long thought to have vanished from this part of the country. In a fight of man against bear, Peter doesn’t favor his odds, so he makes a strategic retreat up a nearby sapling. There, he finds something strange: a climbing rope, affixed to a distant branch above. It leads to another, and another, up through the giant tree canopy, and ending at a hanging platform. On the platform is a woman on the run. From below them come the sounds of men and gunshots. Just days ago, investigative journalist June Cassidy escaped a kidnapping by the men who are still on her trail. She suspects they’re after something belonging to her mother, a prominent software designer who recently died in an accident. June needs time to figure out what’s going on, and help from someone with Peter’s particular set of skills. Only one step ahead of their pursuers, Peter and June must race to unravel this peculiar mystery. What they find leads them to an eccentric recluse, a shadowy pseudo-military organization, and an extraordinary tool that may change the modern world forever.